The Hollywood Sign is one of LA's most famous landmarks and is one of the most recognized landmarks in the world. It may also be the only major landmark whose status was completely unintended. It was originally built in 1924 to promote the Hollywoodland real estate development in the foothills and canyons of Mt. Lee, a neighborhood now known as Beachwood Canyon. The Hollywood Sign is located on the south-facing side of Mt. Lee in Griffith Park above the Hollywood Hills. It is in the City of Los Angeles, Los Angeles County, California, USA. The 50-foot-tall billboard, placed on Mt. Lee 1000 feet above the city, was originally lit with 4,000 light bulbs. It was only designed to last until all the property was sold, which they expected to be about 18 months. Nevertheless, until 1939, the company paid for a caretaker for the sign (1), who lived in a cottage behind the first L. When they ran out of funding for the caretaker, the sign fell into disrepair, so the developers deeded the land north of Mulholland Highway, including the Hollywood Sign to the City of Los Angeles in 1944 and it became part of Griffith Park. In 1949, the City of Los Angeles was beginning to tear down the dilapidated sign when community outcries changed the plan and led to the sign's restoration, minus the LAND and minus the lights. In the 1970s, the sign was once again in bad shape. Hollywood's A-list rose to the challenge and various celebrities helped foot the bill for a complete restoration. Alice Cooper sponsored an O, Gene Autry paid to rebuild an L and Paul Williams put up the cash for the W. The famed landmark got its most recent paint job in 2006. In 2010, a large chunk of Mt. Lee came under threat of development after the Howard Hughes Estate sold a large parcel of land there to Chinese developers. A fundraising campaign which covered the sign with the words "Save Our Peak" successfully raised enough money to buy the land and add it to the adjacent Griffith Park, protecting the cherished view for future generations. On a clear day, the Hollywood Sign is visible all across the Los Angeles Basin, including from Downtown high-rise buildings, and even from Signal Hill, almost 30 miles south (through the coin telescopes at least). Driving or walking around Hollywood Blvd, you can look north at just about any intersection and see the sign, but the following pages offer some special viewpoints with great photo opportunities to get a nice shot of the Hollywood Sign. Depending on how the vending carts are stationed, you can sometimes get a first framed glimpse of the Hollywood Sign walking up the left side of the stairway from Hollywood Boulevard into the Babylon Courtyard at Hollywood & Highland shopping and entertainment complex. 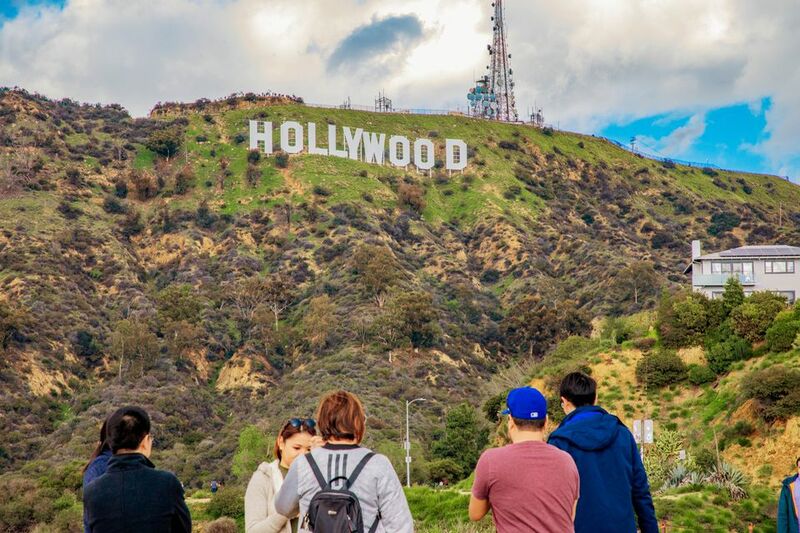 The view from the steps is sometimes blocked by the carts or umbrellas on the plaza, but that's ok ​since your best photo opportunities are from the viewing area at the back of the plaza or take the escalators up to the viewing bridges, where you can see the sign on the hillside above Hollywood. Weather conditions and smog affect visibility, but you're pretty close here, so even in rain or fog, you can usually make out the sign. There are coin operated telescopes to get a closer look, so don't forget your quarters. When you park in the parking lot at the Griffith Observatory, there's a nice view of the Hollywood Sign over the next ridge. The closest view of the sign is along the railing on the right side of the parking lot as you face the Observatory. Driving Mulholland Drive is an attraction in itself, but the easternmost viewpoint on Mulholland Drive (near the 101 freeway), called the Hollywood Bowl Overlook, also has a great view looking back at the Hollywood sign to the northeast. You'll notice that this photo of the Hollywood Sign, taken from Lake Hollywood Park, actually says "Hove the Wook." It was taken in 2010 after the successful Save the Peak campaign, which raised the funds to buy the mountaintop property which houses the sign and add it to Griffith Park, preventing it from being privately developed. This shot was on the day they were taking down the letters. At the back corner of the parking lot at Griffith Observatory is the trailhead for several Griffith Park hiking trails on Mt. Hollywood. Just a short way up the main trail, just past the sign indicating that LA's sister city Berlin is 5795 miles east, is a shady viewpoint with a bench looking out to the Hollywood Sign. This spot is on my list of the Most Romantic Places to Propose in LA. Dante's View on Mt. Hollywood is a bit of a hike from the parking lot at the Griffith Observatory, but its high vantage point provides an incredible view south over Griffith Observatory to Downtown Los Angeles and West to the Hollywood Sign on Mt. Lee. It's one viewpoint where you find yourself looking across, rather than up at the sign. A forest fire burned Dante's View in 2008, but there's little evidence remaining. You can't hike right up to the Hollywood Sign, but you can hike to an area behind the sign from various starting points in Griffith Park. Do not double park or block driveways, and pay attention to parking signs in the neighborhood. Some areas have permit-only parking on weekends and holidays and the area is well monitored. Be respectful of the residents. There are a couple different outfitters in Griffith Park that offer horseback rides to the Hollywood Sign, depending on whether you want to start on the south side of the mountain, near Hollywood or the north side near Burbank. Learn more about Horseback Riding in Griffith Park. You can also go Trail Riding in other parts of LA. Really the coolest view of the Hollywood Sign is from an air tour flying overhead. It's not really difficult to get an aerial view of the sign; there are plenty of Air Tours of Los Angeles that fly over the landmark. You can choose from helicopter or airplane tours.